Ada Metro S.W.A.T. handles hazardous situations that are beyond the normal duties of patrol deputies, investigators, or outside agencies who request assistance. 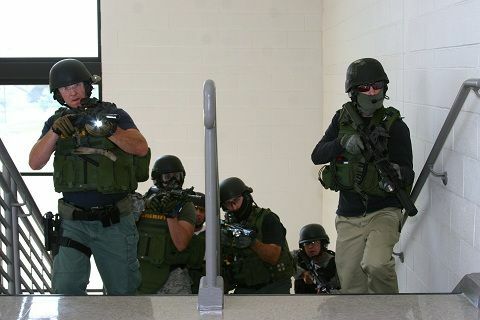 These situations require the need for special tactics, equipment, and/or weapons for a safe resolution. S.W.A.T. was established to provide specialized support in handing critical field operations where intense negotiations and special tactical methods are required. This combining of resources allows us to save taxpayer money while fielding an expert team of S.W.A.T. Operators with the equipment needed to safely resolve high-risk situations. The goal of all S.W.A.T. activations is the safe resolution of a high-risk incident with no injury to hostages, uninvolved citizens, law enforcement officers or suspects. In addition to handling high-risk situations, the S.W.A.T. team also reaches out to the public by attending various community events each year.